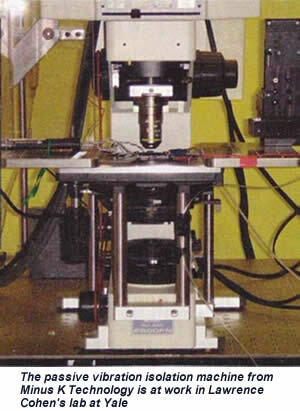 The air tables many research labs use to isolate delicate experiments from vibration can be insufficient for measuring at the angstrom and micron levels. Yale University's Professor Lawrence Cohen found a better solution for his brain-imaging experiments in Negative Stiffness vibration isolators from Minus K Technology, Inglewood, Calif., (minusk.com). "The device reduces vibrations better than air tables because it works in all three axes," says Cohen. 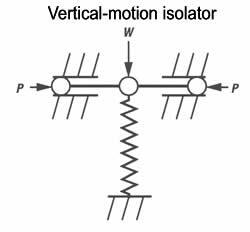 Negative-stiffness isolators use a completely mechanical concept to isolate vibrations. The firm says its tests show that a properly adjusted unit can cut vibration 93% at 2 Hz, 97% at 5 Hz and 99.7% at l0 Hz. The University' design uses three isolators stacked in series: a tilt-motion isolator sits on a horizontal-motion isolator and these mount on a vertical-motion isolator. To view micron-level changes, Cohen's lab uses a camera capable of 2,000 frames/sec. "Measuring brief changes requires vibration isolation because they are so small," says Cohen. "Any movement in the lab has a big effect. If you are viewing at ten microns, and the apparatus vibrates by ten microns, you are in big trouble." The vertical-motion isolator uses a conventional spring connected to the company's negative-stiffness mechanism which consists of two bars hinged at the center, supported at their outer ends on pivots, and loaded in compression by a force P. The spring is compressed by a weight W to an operating position. The stiffness of the isolator is K= Ks - Ka where Ks = spring stiffness, and Kn = magnitude of a negative stiffness which is a function of the bar lengths and load P. The developer says isolator stiffness can approach zero.